ATEN Technology will join Almo Professional A/V to give resellers, integrators, and consultants the opportunity to learn how to create integrated AV experiences during the distributor’s E4 AV Tour in Washington, DC. on March 6, and Dallas, TX on April 24. At both events, ATEN will provide live and static demos of its pro AV solutions, as well as offer an HDBaseT Certification course for installers and integrators. A recipient of an SCN 2017 Stellar Service Award, the E4 program offers AV professionals the experience of a full day of educational sessions worth AVIXA CTS Renewal Units (RUs), as well as exclusive access to the newest AV products and services. ATEN will provide live demos of its VE8950 - 4K HDMI over IP Extender. Engineered to meet the demands of large-scale, multi-display, 4K signal transmission, the solution is designed to be easy to set up and operate. It is well suited for a wide range of environments, such as trade shows, airports, university campuses, conference centers, and shopping centers, and delivers visually lossless 4K AV signals with low latency over long distance via a local network of standard Gigabit network switch. Additionally, ATEN will provide static demos of its video matrix, video extender, video splitter, video switch, and video converter with 4K solutions. 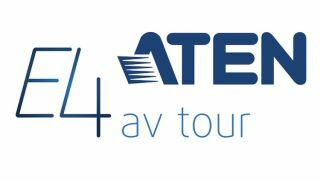 ATEN will offer HDBaseT Certification at both E4 events. The HDBaseT Certification course is targeted at both the beginner and expert installer, and includes technology principles, installation dos and don’ts, best practices, product certification and interoperability, and a hands-on tutorial and demonstration. The course’s instructor is YT Liang, an ATEN Technology product manager. For more information about ATEN’s HDBaseT Certification training at E4 in Washington, DC, click here. For the Dallas, TX show, click here. E4 Washington, DC is on March 6 at the Sheraton Tysons Hotel from 7:30 a.m. to 4:00 p.m. E4 Dallas is on April 24 at the Hyatt Regency Dallas from 7:30 a.m. to 4:00 p.m. Both events are complimentary (including parking) for Almo Pro A/V’s reseller, integrator, and consultant partners. To register, click here.